A couple of years ago when I visited my homeland Bosnia I brought back a French/International cookbook, which my dad gave to my mom for their first marriage anniversary. So many things were taken out of our home during the war, and I was pleasantly surprised that our book collections were still there! The only thing missing from this book was its shiny photo cover which I remember so well. The cookbook it self has 750 pages full of the most spectacular recipes of French and International cuisine. The cookbook is by Henri-Paul Pellaprat “L’Art culinaire moderne” 1969 edition, and in Croatian translation it is just simply called “The Great Pellaprat”. I remember as a child going through its pages, looking at all the photos and wondering how would all these amazing meals taste and how is it even possible to make such works of art. Today was Father’s Day and a perfect day to try and bake something from this amazing cookbook. 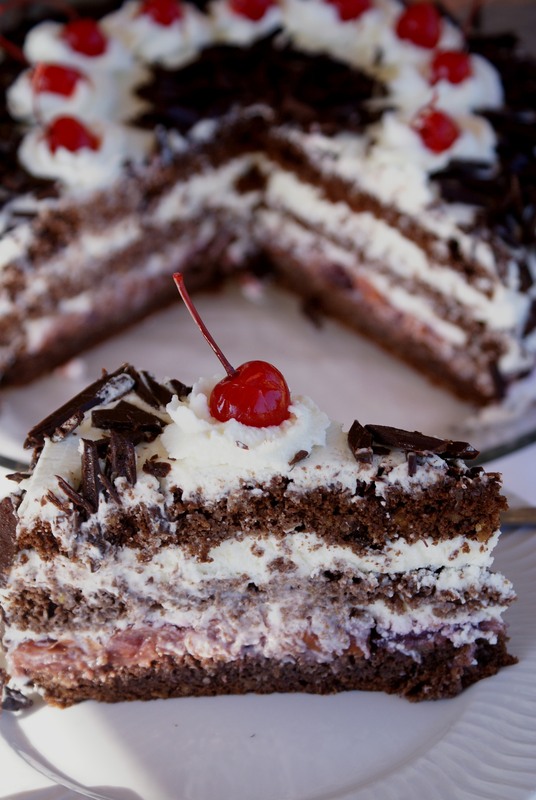 Out of the hundreds of dessert recipes I chose a familiar one – Black Forest Cake. Familiar, because after we left Bosnia, we lived in Germany’s Black Forest region, our children were born there and it was just an amazing time of learning to live away from home, accepting the life changes and building a better future for our children and us. About 1 quart (900 ml) heavy cream (whipped) *** Original recipe calls for 600 ml, but that was not nearly enough to frost the cake inside and out and decorate it. For the cake beat egg yolks, 1 whole egg, sugar and water until foamy. Add bread crumbs and ground almonds. Now by hand gently fold in egg whites. Add sifted cocoa at the end. Pour the batter into the spring form pan and bake for about 25 – 30 minutes. Cool completely and slice horizontally into 3 equal layers. Heat the sour cherries with juice in a small cooking pot and bring it to boil. Mix 1 tablespoon corn starch with some of the cherry juice and pour into the pot. Let it boil for a few minutes until it thickens. Cool completely. Whip the heavy cream until firm. Add sugar (after your own taste) and vanilla extract. Take the bottom cake layer, sprinkle it with some “Tipsy cherries” brandy (or Kirsch Wasser), spread the cherries on the top of it. Spread 1/3 of the whipped cream on it. Place the second cake layer on the cream, sprinkle with cherry brandy and spread with the second part of the whipped cream. Sprinkle the third cake layer with some cherry brandy and place it on the top. Frost the whole cake all around, decorate the top with tipsy cherries and chopped chocolate pieces. 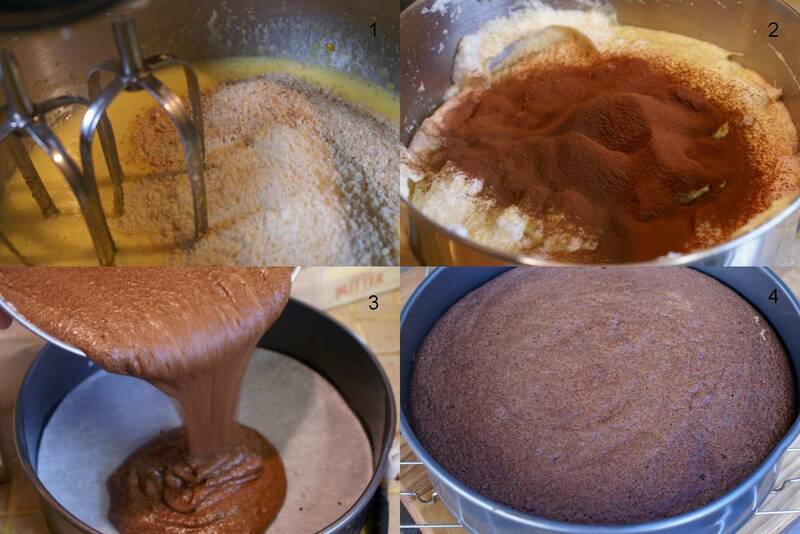 Place the cake in the fridge over night and serve the next day. The black forest area of Germany is so beautiful and has wonderful food. 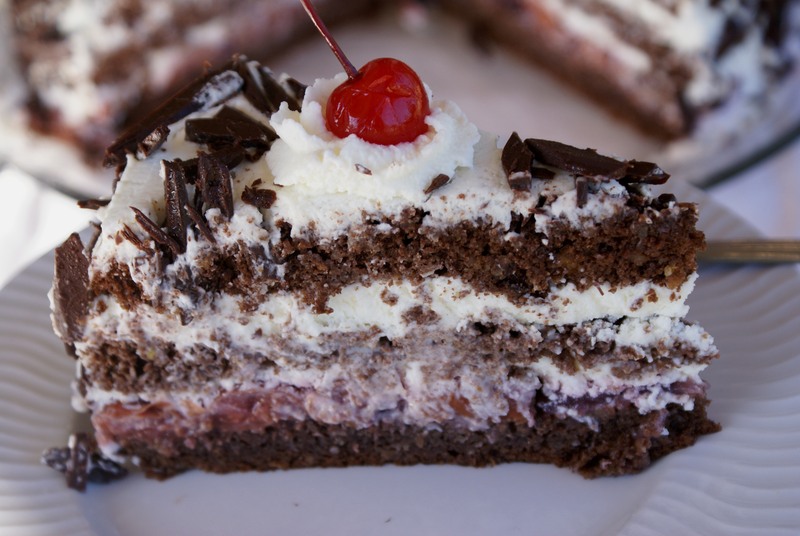 Black forest cake is delicious and a favorite of mine. I can’t wait to try your recipe…it is very different with the breadcrumbs and ground almonds. No flour! 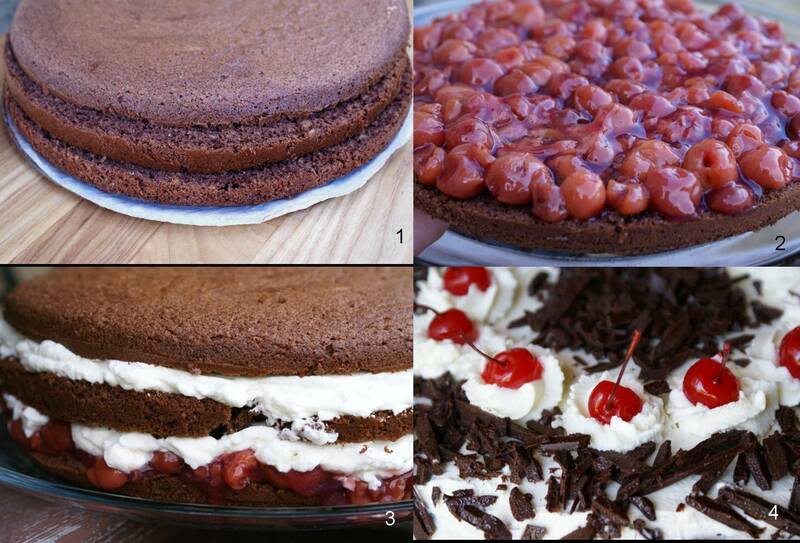 A surprising recipe for Black Forest Cake, but if it tastes as wonderful as it looks, it’s got to be a winner, Sibella. I know! I was surprised myself, but after trying this version I will never make it any other way. Flour is absolutely not necessary! 🙂 Thanks for visiting Kathleen! As usual your cake looks like it came straight from a gourmet bakery 🙂 Absolutely beautiful, and how interesting to make it with bread crumbs. 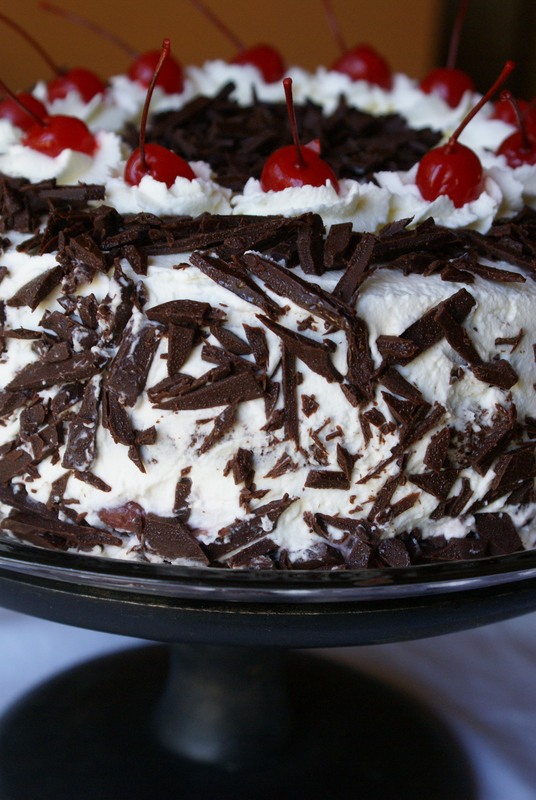 Black Forest cake is my dad’s favorite so we had it every year for his birthday – delicious! Your cake are so professional-looking and beautiful… yum! Beautiful images – as always. 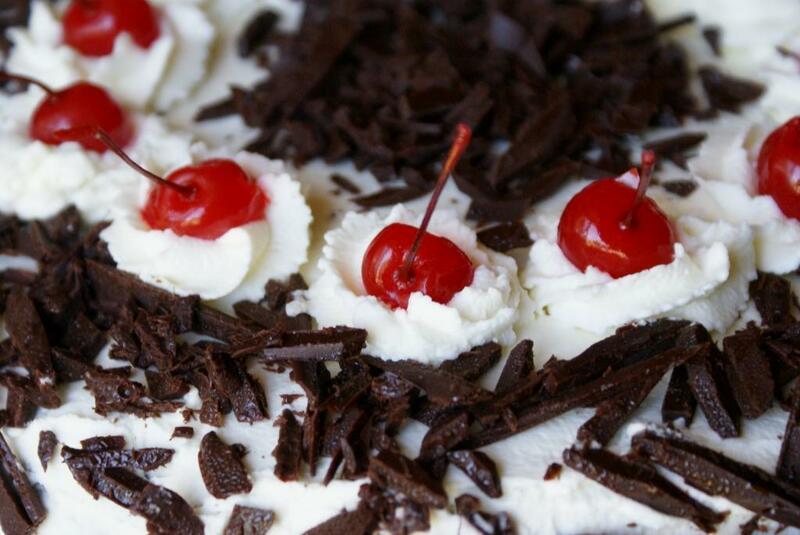 Black Forest cake is one of my all time favorites. I made one a long time ago, but not again. It was labor intense. You make it look so easy – ha! Thank you Darryl! It was labor of love and I enjoyed every minute of it! 🙂 It’s really not that hard to make it compared to some other cakes. Thanks Bobbi! I haven’t baked anything in a while either. It is just way too hot!